When Debbie shops, it's a total out of body experience. 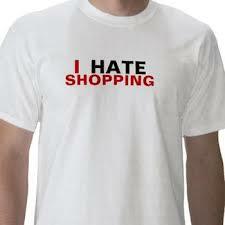 When I shop, it's a total out of my mind experience. She loves it and I hate it. That's a strong word ... I really dislike it (a lot). On this particular day, we were only looking for only one gift. What I have come to realize is that whether you are shopping for one gift or one hundred gifts, there is a minimum time requirement. Silly me ... if I know what I want, I just go in and pick it out and leave. 1. Sweeping the store. Not the broom kind ... the reconnoissance kind. 2. Inspecting the merchandise. This would be looking carefully at the targeted item for purchase once you find exactly what you want. 3. Continued shopping. NEVER pick the first thing you find even though it's what you want. There might be something else that is better. 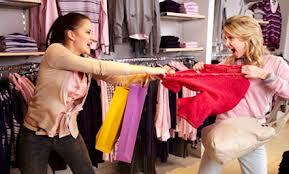 4, Ask the salesperson for alternatives in the stockroom. 5. Once the other five items are brought to you from the stockroom … Inspect them carefully and compare it to your first choice. 6. Decide on the first thing you saw. 7. Check your watch to assure that there has been at least 2 hours spent on this purchase before they ring you up. 8. Pick up your husband who has been wandering aimlessly outside of the store.